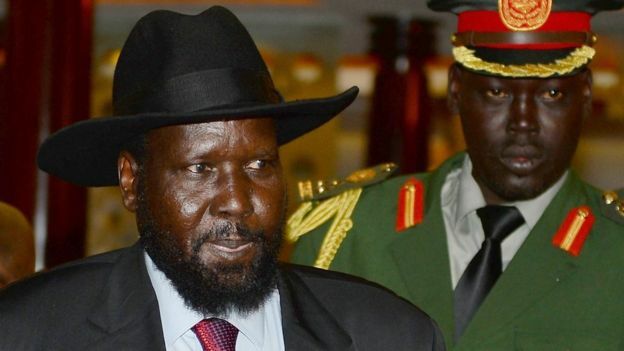 President Salva Kiir Mayardit has said South Sudanese do not regret their decision to attain independence from Sudan 6 years ago, despite the on-going conflict that has since displaced millions from their homes. JUBA, 10 July 2017 [Gurtong]-Kiir made the statement in his address to the nation on the day of the 6th anniversary of independence, which is not officially celebrated due to lack of funds. “Six years into our independence, many critics have questioned whether it was wise for the people of South Sudan to choose independence, simply because we have not been able to solve our differences amicably. Our answer to these critics is that the people of South Sudan do not regret their decision. I am confident that if the referendum for independence were to be held again today, the people of South Sudan would still choose to be free,” he said. “It is not a process that happens overnight. Together, we embarked on this journey of managing politics and implementing state bureaucracy,” he said. He urged the citizens to choose patriotism, to embrace unity. “We have the power to bring about change that will benefit and develop this nation, the country that we all dreamed to have and cherish. We must embrace a collective vision, and more importantly we must have the courage to pursue it by all means,” he said. The president also announced a sum of 2.4 billion South Sudanese Pounds for the National Dialogue, which he said will bring back the country together. He said many people, were pessimistic when the National Dialogue was first launched but in the last two months it has gained support both internally and in the international community. “It is therefore incumbent upon all of us; both government and opposition, to let the national dialogue succeed,” he said. He said he believes that the national dialogue is the only viable formula for resolving layers of conflicts that have deeply affected the country. He also appeals to all international partners, the IGAD countries, East African Community, the African Union, the UN Security Council and the UN General Assembly, to support the National Dialogue process in South Sudan. Kiir said he still believes that the year 2017 would be a year of peace, despite the many challenges ahead. He said he is encouraged following the declaration of the unilateral ceasefire, of which the general security situation has improved. The President noted that the government is reaching out to the different armed groups, calling on them to renounce violence and embrace peace through the National Dialogue. According to Kiir, some of the armed rebel groups across the country have accepted the call for peace through the National Dialogue, and abandoned rebellion. He repeated the governments’ call on the armed groups to reciprocate the ceasefire, and respect the cessation of hostilities agreement to achieve a permanent ceasefire. He said the country is politically divided and must find ways and means to unite the people and build one nation. Meanwhile in Gok State, masses gathered in Cueibet County to celebrate the 6th anniversary of independence of South Sudan despite the numerous inter-communal conflicts in the area. The Governor of Gok State, Madhang Majok Meen urged especially the youth to refrain from violence and focus on development activities in the country. He warned that whoever will be found inciting others will be dealt with according to the law. The Governor appreciated the organized forces for curbing insecurity in the State. The deputy Governor of Gok State, Kongor Deng Kongor urged Gok community to be peaceful and restrain from intra-communal conflicts.